With Measure you're able to measure the distance from you to an object and the height of it. 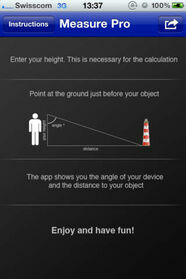 To measure the distance hold your device vertical and point on the ground of your object. The app displays the angle of your device and the distance to the object. To measure the height get the distance and then click on the height button. Align the crosshair to the top of the desired object. Lay down your device on an even surface and press the "Calibrate Now" button for calibration.